On my travels at the moment... my tatting is a bit crumpled but I'm showing it you anyway. Just two more medallions and I'm finished with the centre and can start the rounds of split rings. I had to tie something to the centre medallion because I kept forgetting where I was suppose to add a new motif next. I hope the spring sun is shining and bringing you happiness wherever you are. Ich wünsche Ihnen auch ein frohes und sonniges Osterfest. Die Decke gefällt mir sehr gut. Man sieht jetzt den Fortschritt. Leider haben wir hier noch keine Sonne. Es ist trübe und kalt. 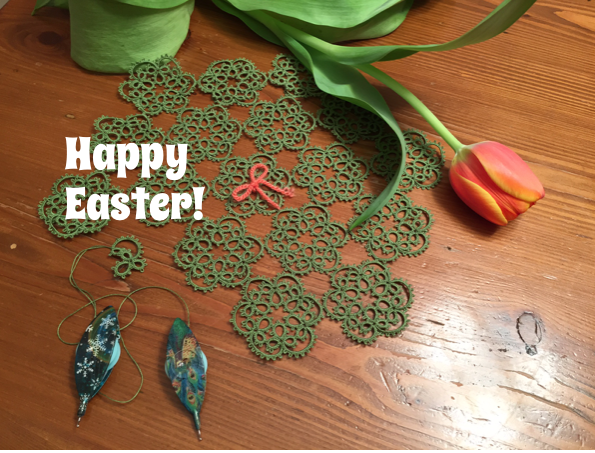 Crumpled or not, your tatting is always beautiful! Happy Easter! Oh how pretty! Tying the ribbon is a quick clever solution, plus it looks nice too. Can't wait to see those split rings! I'm a bit late so I hope you had a happy Easter where ever you are. I love your idea of a ribbon in the middle brilliant idea, looking forward to seeing the rest when you next show us.